From the rockiest trail to the wildest surf, you want to shoot crisp, clear video your audience will actually enjoy watching. SteadyShot normalises the oscillation the image brings to the sensor. This means motion blur and noise levels are reduced, even in low light. Time-lapse Capture lets you produce time-lapse movies easily by using high-quality 4K still images shot at designated intervals. Then Action Cam Movie Creator (v. 5.1 for Windows, v. 3.1 for Mac) or Action Cam App (v. 2.0) simply transforms these images into an impressive time-lapse movie. Discover how easily built-in Highlight Movie Maker works with face detection for in-camera auto editing. Highlight Movie Maker also supports a wider range of scenes — not just sports performance but also daily situations and travel — automatically selecting highlight points of footage to create a highlight movie, complete with background music. You can share your work immediately by using smartphone. Explore sophisticated shooting features for thrilling action movies you'll be proud to share with family, friends, and fans. Use advanced manual settings like white balance and AE shifting, and optimise brightness and hue to match images of other camcorders for easier movie editing. Show your skill and style as director and action star. See every detail of fast-moving action in smooth slow motion, thanks to 120fps high frame rate recording at HD resolution. Catch fast-moving action with burst shooting. This allows you to take a maximum of eight high-quality shots of a trick or transition, making it the perfect feature for those who love go back and analyse their style. Settings are 8fps/1sec, 5fps/2sec, and 2fps/5sec. Capture an entire action sequence in a single frame. This feature creates a composite image of a subject in motion, with variable settings for different burst speeds, which are: 8fps/1 second, 5fps/2 seconds, and 2fps/5 seconds. Use up to five cameras to get exciting ground-up or head-down shots. And control them all effortlessly with Live-View Remote (not supplied with HDRAS50) or smartphone with PlayMemories Mobile™ app. Make your movies look even better with Action Cam Movie Creator. Produce and edit videos quickly and easily thanks to a range of features such as 4K Time-lapse Capture and slo-mo video. You can also flip your videos clockwise or counter clockwise by 90˚ with Movie Rotation, or use Multi View to combine up to four movie footage segments – captured simultaneously by different cameras – and make a split-screen composite. Built-in tripod socket means you can quickly attach your Action Cam to a tripod for rock-steady shots. 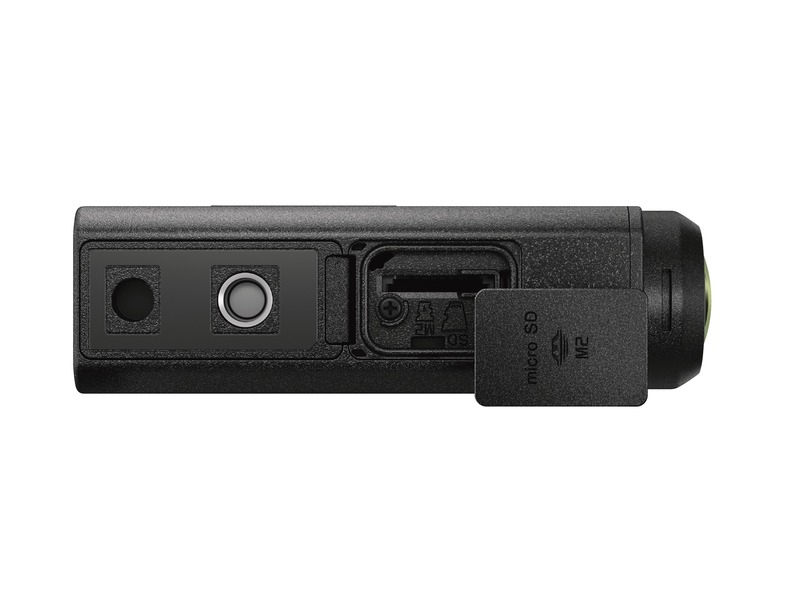 And, USB connections are now located on the back of the camera for enhanced ease of accessory attachment. 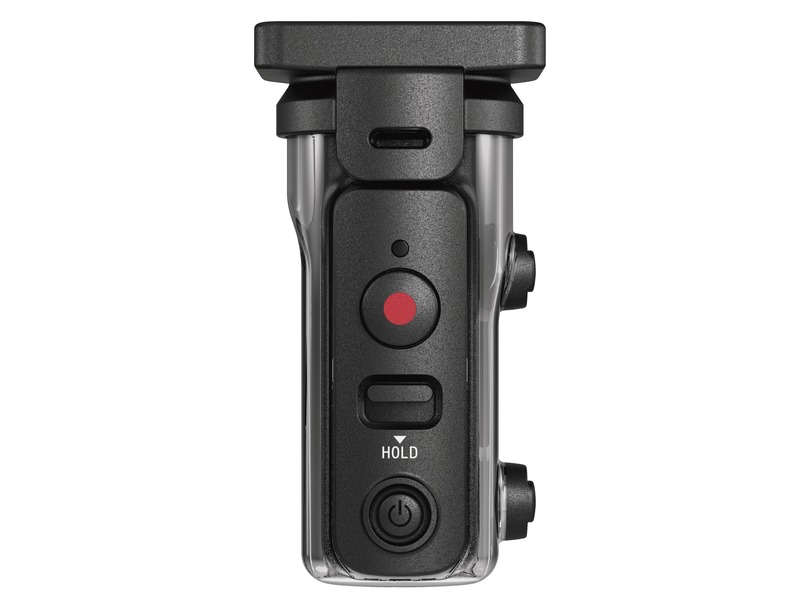 This Action Cam features three tally lights on the front, top, and rear of the camera. Now you can easily check the recording status from various directions, as well as hear the sound of the helpful beep reminder.